Article: Alex Varty - International Symposium on Electronic Art takes high tech to the park. At ISEA, Oscillations offers multi-media installations, voice processors, and even dog frequencies, Georgia Straight, August 12, 2015. Article: Joshua Robinson, Aspiring Artists Find Unexpected Healing In Workshops, Thunderbird.ca, Dec. 14, 2014. The Vancouver Sun, April 24, 2014. VANDOCUMENT: Documenting Vancouver's Creative Movers n' Shakers, August 5, 2013. Article: Fiona Morrow, Things To Do in Vancouver July 26 - 28, Huffington Post, July 26, 2013. LocoMotoArt would like to thank the Vancouver Park Board and West Point Grey Community Centre for the generous support for LocoMotoArt as artists in residency at Aberthau Mansion Fieldhouse in Vancouver, BC. LocoMotoArt would like to thank their 2015 partner for their kind and generous support! 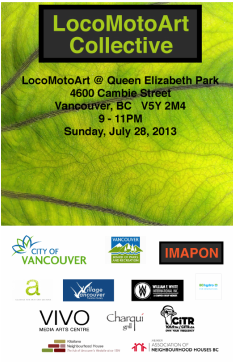 LocoMotoArt would like to thank their 2014 sponsor for their kind and generous support! LocoMotoArt would like to thank their 2014 radio sponsor for their kind and generous support!